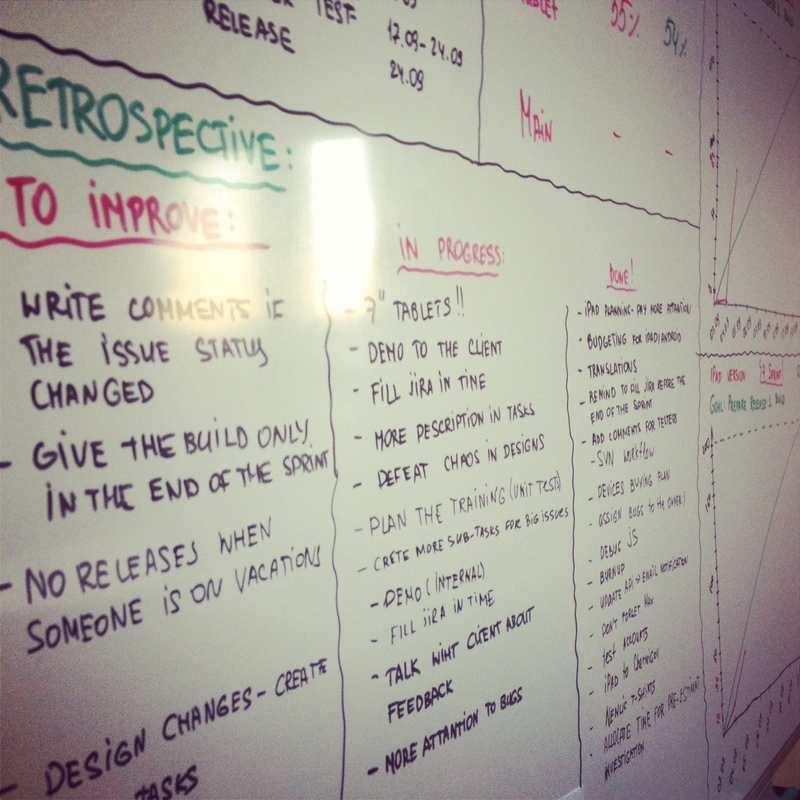 No doubt retrospectives are one of the most important meeting in the development process. But teams usually tend to ignore them. If you don’t push them they just stop doing retrospectives at all, as this activity seems “useless” to them. But when else can we get such a magical push and start changing for the better, if not during retrospective? We can continue making the same mistakes over and over again. Do not perform retrospective in the team’s room, as they get distracted and their attention is scattered. It is really hard to persuade some developers to leave their notebook in peace for an hour. Some powerful glue connects developers to their device. There should be conformable chair in the room and a board. You can use a terrace, if you have it (yes, it’s from the office of my dream). Make team relaxed, they should be prepared to share the most hidden secrets with you. designer (especially, if he is not sitting in one room with the developers. It is the time to share his opinion about how his gorgeous design looks in the ready application). Sometimes (and only sometimes!) – Product owner. Invite him when you think it is necessary. 1) Introduction (3-5 minutes): Scrum master wakes up everyone and tell the legend – why all of you are here. SM can use some short warming activity, as simply “Wake up, guys!” does not work. Sometimes you should add a good kick after these words before anyone becomes conscious. 2) Try to remember, what you did during the sprint (15-20 min). Scrum master shows the graphs (burn up/down, release burn up/down, etc.) Team is to discuss the results of the sprint. Sometimes I use any of the team games to discuss developer’s mood (like Energymeter). 3) Discussions (20 min) – the most interesting part. We talk about the good and “not so good” things which we faced during the sprint. What we can improve. The most important thing here is – not to interrupt. Note: Scrum master should make it clear to everyone in the team that we are not discussing the team members or the client – we are discussing the process. We do not blame anyone. Scrum master is usually the one to write down all the +/- on the stickers and attach them to the board. In + were the good things, – contained what we should improve. To do – own actions to improve the process. 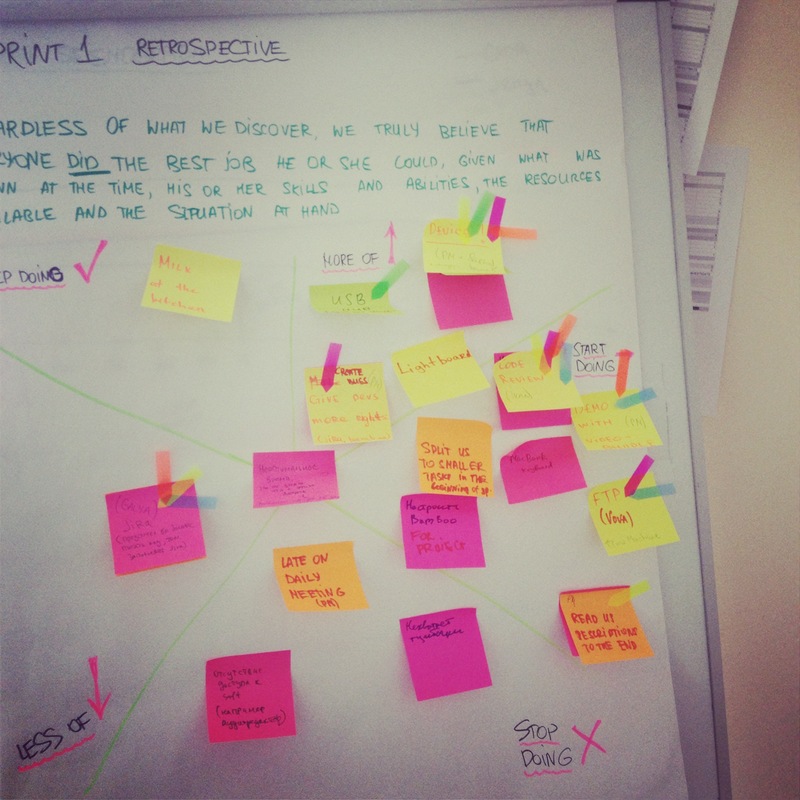 4) Suggestions and voting (20 min): We go through all the items with the team and define “what we can do with that”. After that I give every team member several “votes” (small stickers) and they mark the most important items. Winners (with >3-4 votes) become our “To do” for the next sprint. 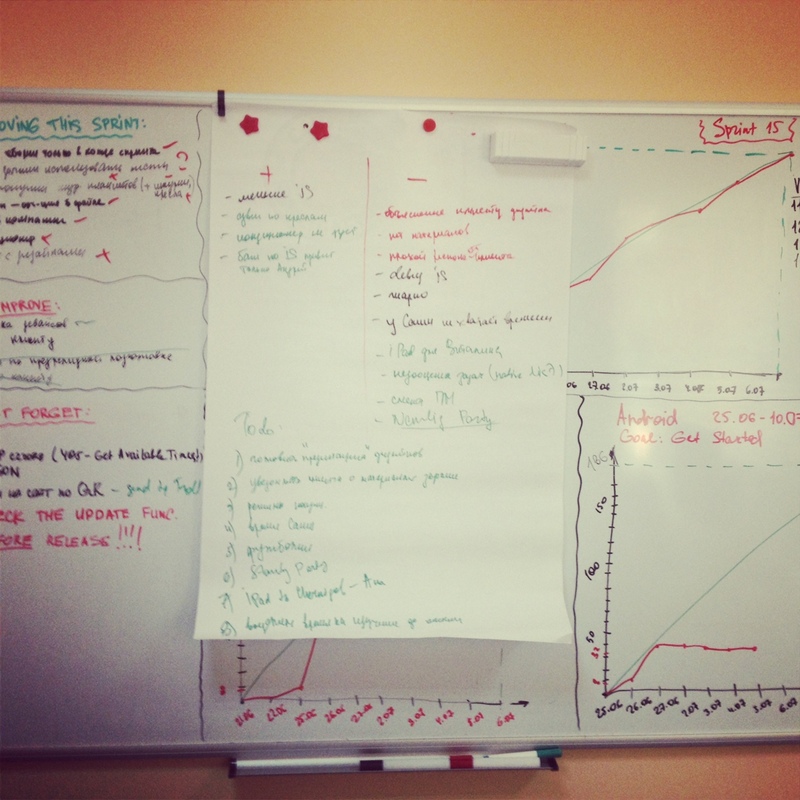 As you can see from the first photo – we tried to do everything during one sprint. But we failed 🙂 So we plan only 2-3, sometimes 4 tasks for the sprint. 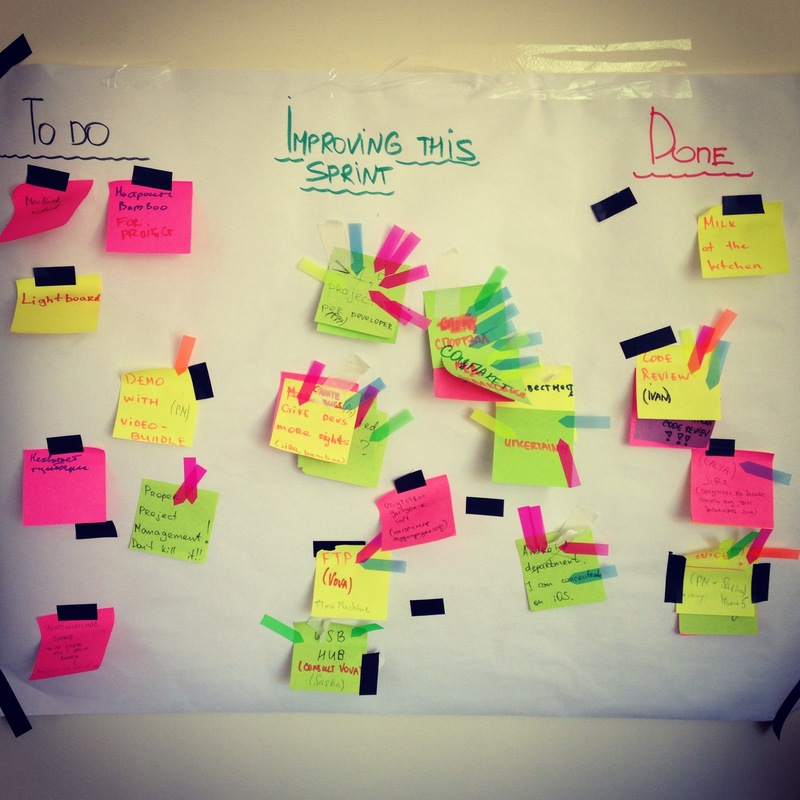 It allowed us to see all the tasks in “Done” in the end of the sprint. Why do we need this board? To avoid the issue we had previously – just post the retrospective results in Jira and forget about the tasks…till the next retrospective. Retrospective board helps us to keep in mind what we have to do during this sprint (during daily meetings insidious SM can ask “How close we are to our goals?”). This part of the retrospective is also the best for discussing the velocity issues, planning and estimating issues. 5) The end (3-5 min): Scrum master thanks everyone, everyone gets presents and awards. Scrum master praise the team. Here you can read what crazy paintings we make during the retrospectives. Hi, my name is Galina. I am an enthusiast of having fun at work. Scrum master, agile change agent, software engineer, former Project Manager(never again! ^-^), processes improvement nazi, whiteboard drawing and paper prototyping 80 level. This blog is about my office life and hobby. P.S. Please don't mistake me for an expert in anything.